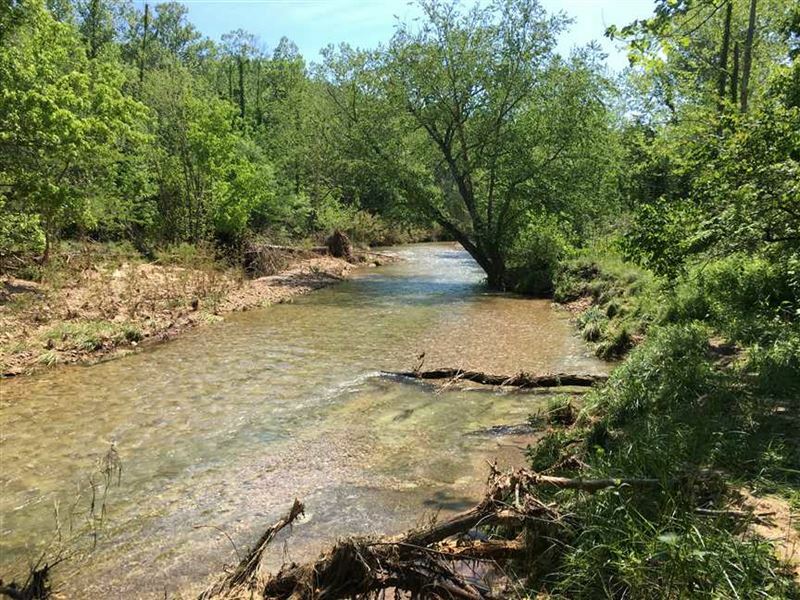 965+- acres Two Bedroom 2.5 Bathroom Metal Building and 270+-Pasture and 695+-Hardwoods ranch/hunting ground, mixed use recreational, Year Round Creek, for sale in Marion County Arkansas. Over 1/4 mile of year round spring fed Hampton Creek runs through the middle of the property, The headwaters of the springs are on this property. Good Barns and lodge two Bedroom 2 Bath with great room and Kitchen with well, rural water, electric and sewer. Good access from county road only 8+- miles from town of Pyatt on world famous Crooked Creek and 8 miles east of Highway 65, North of Saint Joe. This property has caves and year round springs providing awesome creek views and building sites. This acreage has been maintained for hunting but can easily be converted to either Forrest or Pasture 290+- acres for cattle and horses. Recreational opportunities abound with Crooked Creek, and the Buffalo River located twenty minutes away. Flippin Arkansas is 15 miles, Harrison is 25 miles, and Mountain Home 28 miles away. Turkey, Deer hunt in the morning and canoe, white water kayak on the property in the afternoon. The lodge is a metal building and the Barn is 60 x 140. This Land for sale north of Saint Joe, Ar. has many attributes This property could be turned into an ATV Park, equestrian trails park, hiking trails, biking trails, at the same time the property could be used for recreational, timberland, ranchland. Contact Eric for a showing The property has good roads cut in the perimeter.